FANBOY PLANET.com . : mc-freema :. publicity shot courtesy of the BBC. Still reeling from the news that Billie Piper leaves Doctor Who at the end of Season Two, fans have now been given a name and a face for the Doctor's new companion: Freema Agyeman (pronounced "Ag-yee-man"). The BBC made the announcement yesterday, though producer Russell T. Davies and Agyeman herself have known for a while. "I've been keeping this secret from my friends for months," said Agyeman on the BBC website. "It's been driving me mad." Agyeman appears in Season Two's penultimate episode, "Army of Ghosts," in a different role. 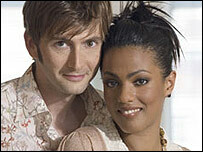 For Season Three, which has yet to be filmed, she will play a woman named Martha Jones. "When I first saw Freema Agyeman she had come in to audition for the part of Adeola in series two," said executive producer and writer Davies. "Watching her during filming confirmed what an exciting new talent she was, so under cover of darkness we called her back in to audition with David [Tennant] for the role of the new companion. "It was an immediate and sensational combination." The BBC report further pointed out that this will be somewhat of television history, as Agyeman will be the Doctor's first companion who is black. Apparently, Rose's sometime boyfriend Mickey doesn't count. If the Sci Fi Network's schedule stays on track, we in the U.S. are at least a year and a half away from seeing this actress. We just finished Season One on Sci Fi, and they might be holding off on Season Two until December, as the first episode to feature David Tennant as The Doctor is "The Christmas Invasion." Season Three is scheduled to start shooting this summer in Cardiff, though Agyeman will not appear in this year's Christmas episode. In the meantime, we have our fingers crossed for the spin-off series Torchwood (an anagram of Doctor Who) that stars John Barrowman as the roguish Captain Jack Harkness. The Torchwood Institute plays into the mythology of Season Two, but how Harkness gets involved remains to be seen.